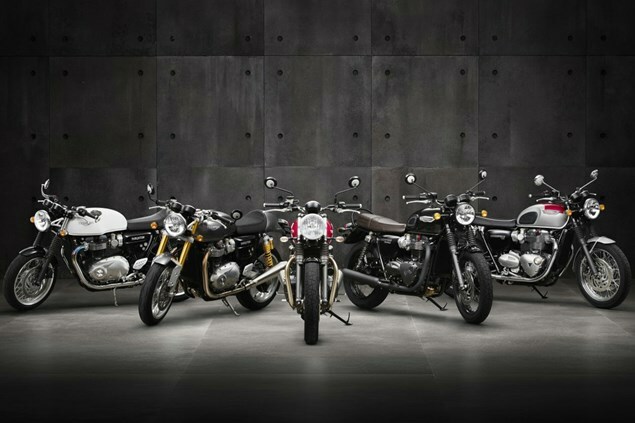 NEXT year Triumph’s Bonneville range is set to grow even more with the introduction of two new 900cc models – the Street Cup and Bonneville T100. Certification documents filed at both the California Air Resources Board (CARB) and the US Environmental Protection Agency (EPA) list both new machines as having the same engine as the Street Twin. That means a 900cc, 55hp, water-cooled parallel-twin tuned for torque rather than outright power. The Bonneville T100 isn’t much of a mystery. The 900cc engine is physically as large as the 1200cc twin already fitted to the Bonneville T120, and prototypes with T120 styling and the smaller Street Twin engine have already been spied testing near the firm’s factory. The biggest visual difference between the prototype 900cc Bonneville and the T120 is that the smaller bike uses the single front disc of the Street Twin instead of the T120’s twin discs. The Street Cup, however, hasn’t been seen. The name clearly suggests it will be closely related to the Street Twin, but the ‘Cup’ element suggests it will be sportier. Perhaps an entry-level café racer, positioned below the 1200cc Thruxton and Thruxton R? Or a less-retro bike altogether? It’s very unlikely that the name could be applied to the new Scrambler, which is also Street Twin-based, since neither the ‘Street’ nor the ‘Cup’ elements seem to suit a bike with off-road-inspired styling. Besides, Triumph already has a decade of recognition in the Scrambler name so it would be a strange choice to ditch it now. The EPA documents also list the old-model Scrambler as being set to remain on sale, in America at least, in 2017. It’s the only remaining model listed with the old 865cc air-cooled twin. That suggests the newly spied, Street Twin-based Scrambler will actually be a 2018 model. Whether or not Triumph will be allowed to continue to sell the old version in European countries in 2017 will depend on it gaining special end-of-series dispensation. The bike certainly won’t comply with Euro4 emission rules and the mandatory ABS brakes due to be fitted to all new bikes over 125cc from the start of next year. However, manufacturers and distributers can apply for ‘end of series’ allowances to let them sell off remaining stocks and give a brief breathing space to develop new models. Numbers allowed to be sold under that dispensation are very limited, though, and it needs to be separately applied for in each European country, with national governments having the final say on whether or not the discretionary allowance is granted.